No, no - not a 3D ultrasound, or even some kind of dramatic early labor story. 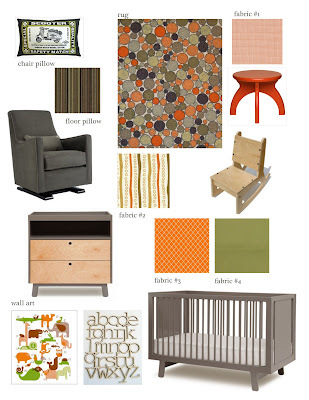 This is all about the nursery. And I absolutely understand if you don't want to look at baby-room stuff - it can be like a Target full of strollers if you're dealing with infertility. I used to skip nursery posts even though I could cope with belly shots. Weird, but true. Since we are moving, this nursery is mostly hypothetical. Or in transit. Or in boxes. Our moving date is vague, but should be sometime in the next few weeks, so there isn't much point in converting the little office nook we have in our old house into a baby's room. We'll just plop him in his bassinet (that I finally ordered) in our room. By the way, back when I mentioned that I had emailed another blogger about her bassinet, she did write back right away - and said her daughter was just growing out of it and would I like it! But she was in NY and the whole taking-apart-and-shipping thing got to be complicated, so I just ordered my own. (I'll just try to keep it in really good shape so I can sell it on Somebody's List after six months. Actually, that's my plan for a lot of stuff...) Anyway, it is nice to know that she loved it. So, this is the problem I mentioned having with the crib sheet. The orange fabric with the little diamond pattern is the only one that is actually made to be a crib sheet. The other options are just possible fabrics that I could sew elastic onto and - voila! - custom crib sheet. And maybe crib skirt-panel thing. We have display railings that I'll use instead of a bookcase, so that the front of the books face out. It makes the books double as artwork, and it's easier for kids to pick out books when they can see the fronts. And even if he doesn't choose his own books for a while, we do have quite a few left over from my daughter's collection (just waiting, in case there ever was another baby.) I always wanted those rails for my daughter's room, but we already had bookcases so we just used those. The glider is my most coveted piece of furniture, the only thing that I think I'll really use for years to come. (I ordered the crib and dresser only after figuring out how much I could sell them for on my local Somebody's List.) I'm planning to use a large floor pillow as a pouf instead of one of those matching glider ottomans, since I need something lower for my feet. I still have to find a good reading lamp and a side table, although I may use the large orange stool for that. So, that's what I've been doing with all this bedrest time. But I would love to hear suggestions, if anyone had something fabulous or knows of something great or has heard fabulous things about such-and-such. I may add decals, or a banner of fabric triangles. I love the idea of a mini-bean-bag chair, maybe instead of the little rocker. Anyway, since I am still figuring it all out, let me know what you think! nice stuff, the glider is awesome, i gave up trying to find one that looked good, was comfortable and wasn't too expensive. we ended up with a regular one that i would normally not have in my house because i don't really like the way they look but it's comfortable and wasn't TERRIBLY expensive. Is that a Vespa on the pillow in the upper left? My DH has a vintage Vespa that is original paint orange. I adore the crib, the rug, the glider...all of it! I also love the idea of rails for books. I'm so stuck on the furniture for ours and haven't been able to make any definitive decisions. Tres chic! I love that you are making it a room that you can enjoy too. I've seriously been thinking about sleeping on the nursery floor lately, just because the room itself - even absent furniture at the moment - is such a soothing place. The little wooden rocker you chose is really adorable, and I have visions of a little boy, selecting a book from the display railing and sitting down in his little rocker to read/look at the pictures! Wonderful! You'll change him on the dresser-top? It's hard to tell how high the side of that is. I LOVE the colors. The rug looks wonderful for hiding spots plus it's washable. Is the glider comfy enough to snooze in? My husband, who seems to share some unfortunate qualities with yours, whined about me waking him up as I'd come back after a night time feeding. With a 5 pounder you're most likely going to be up and down every two hours 24/7. If the chair in the nursery was comfy you could just snooze there waiting for the next feeding. I love it all and especially love how multi-functional you have made it all. "Mom lounge" is such a great way to think of it and everything you have chosen is something any little boy could grow with too. Very hip! I myself am not good at colors/patterns (or being hip at that), but I can appreciate those who are. I'm impressed at your impeccable decorating sense! That's a rockin room! I love, love, LOVE those colors! It's so much better now then girl/pink, boy/blue, unknown/yellow/aqua! So many more patterns and colors to choose from. I would have so much fun doing a new babies room. I do have to say that I want that carpet for my family room. I love the nursery stuff! And I am so impressed that you may be making your own crib sheets! Very cool! Sewing is not my gift and I admire anyone who has the talent to sew! Again, quite impressive! Great colors and design!! PLease post pics when you have the room done, I bet it'll look great! And Ill let you know about the nursing cover thing once I get it... I'm real curious, too, and I hope it's helpful! Ooooh, I'm loving all of it -- especially that rug and wall art. Surely you must be a reader of the "Ohdeedoh" website. I can spend hours on there checking out people's cool nurseries and links to hip kid furnishings. And Etsy! Have fun with this. My boy's room totally turned out to be "my" lounge, too. I still smile every time I walk in there, I love it so much (and I guess.. I hope.. he likes it too?!). Very nice! It looks like it will be a great "lounge". I'll echo Rose's questions .... What are your plans for changing? On the dresser? And what about snoozing, with/near baby? Any room to fit in a chaise lounge into your lounge?